Submitted by mahoney on Thu, 02/21/2008 - 1:11pm. Arbys Roast Beef Restaurants across the USA including Alaska and Hawaii...Arby's was founded by Forrest and Leroy Raffel in Ohio in 1964, who were determined to own a fast food franchise based on a food other than hamburgers. The brothers wanted to use the preferred name of "Big Tex", but that name was already being used by an Akron businessman. They eventually decided on the Arby's moniker, based on R.B., the initials of Raffel Brothers , thus Arby's, LLC, was born. By coincidence, R.B. can also be short for roast beef, the company's main product, a point which was used when the backronym "America's Roast Beef, Yes Sir" was used as an advertising campaign in the 1980s. After a long interim between successes, Arby's capital had been quite diminished, so a completely new franchise system had to be devised. The Raffel brothers opened the first new restaurant in Boardman, Ohio (located just outside of Youngstown), on July 23, 1964, where they initially served only roast beef sandwiches, potato chips and drinks. A year later, the first Arby's licensee opened a restaurant in Akron, Ohio. The famous Arby's 'hat' was designed by the original signmakers, Peskin Sign Co (they continue to make signs for Triarc). Expansion to other states began in 1968. 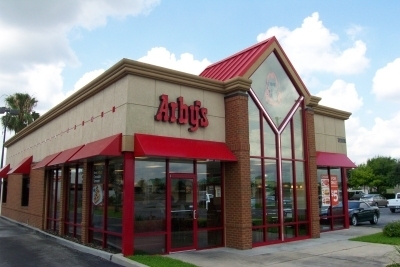 Triarc Companies, Inc., purchased Arby’s in 1993. As of 2006, there are over 3500 restaurants. This is a complete revision to the file. It now includes the Canadian locations. All locations (USA and Canada) were compared and verified to the listing on the Arby's website. If any locations were not listed on the website, they were deleted from the file. Thanks to the members mentioned below for aiding in the verification of this file. Updated the file. Net increase of 44 locations. Noted. The location on Michigan St in Plymouth,IN has closed. Completed file update. Net increase of 39 locations. Updated FL locations. Net increase of 5 locations. Deleted the location in Beaver Dam Service Plaza in KY. Submitted 4 missing phone numbers. Updated the file. Net increase of 2 locations. Updated the file. Added 193 locations, corrected 45 addresses, 14 cities and deleted 556 locations. Decrease of 363 locations. Submitted a closed location at 3666 E Route 66, Flagstaff,AZ. Corrected the coordinates for the location in St Cloud,Mn. Corrected the coordinates for the locations in Peru,IL, Abrams,WI and Houghton,Mi. Submitted a closed location at 809 N Lake St, Aurora,IL. Submitted correct address and coordinates for the location in Jacksonville,IL. Submitted corrected coordinates for the location in Gallipolis,OH. Added locations in Anderson,SC and Fair Play,SC. The location at 641 Rainier Ave S, Renton,WA has closed. Submitted corrected coordinates for the location in Reidsville,NC. Corrected the coordinates for the location at 2219 Mentor Avenue, Painesville Township,OH. Submitted closed locations (2) State College,PA. Updated the Canadian locations in the file. Net increase of 18 locations. Submitted corrected coordinates for the location at 1077 Branson Hills Pkwy, Branson,MO. Submitted a new location at 8282 West Camelback Rd, Glendale,AZ 85303, (623) 877-3550. Noted that the location at 3021 Washtenaw Ave, Ann Arbor, MI has closed. Submitted a closed location at 1664 Bath Rd, Kingston,ON. Submitted corrected address and coordinates for the location in Jacksonville,IL. The location in Kingston,NY has closed. The location at 24125 Hemlock Ave, Moreno Valley,CA 92557 has reopened. Submitted 10 phone numbers to be added to the file. Corrected the coordinates for the Glasgow,DE location. Completed comparing the KY listing with the website locator. Completed comparing the KS listing with the website locator. Completed comparing the VA listing with the website locator. Completed comparing the NC listing with the website locator. Completed comparing the MO listing with the website locator. Completed comparing the OH listing with the website locator. Completed comparing the MN listing with the website locator. Completed comparing the NY listing with the website locator. Completed comparing the OK listing with the website locator. Completed comparing the MD listing with the website locator. Reformatted file. Added missing addresses and phone numbers. Added city and state to column 3. Added Canadian locations .